The extra-linguistic sub-competence is made up of encyclopaedic, thematic and bicultural knowledge. The translation knowledge sub-competence is knowledge of the principles guiding translation, such as processes, methods, procedures, and so forth. The instrumental sub-competence comprises the knowledge required to work as a professional translator, such as the use of sources of documentation and information technologies applied to translation. The strategic sub-competence integrates all the others and is the most important, since it allows problems to be solved and ensures the efficiency of the process. It consists in the capacity to follow the transfer process from the source text to the production of the final target text, according to the purpose of the translation and the characteristics of the target audience (Hurtado, 2001: 395-397; PACTE, 2005: 611). Hurtado Albir, A. (2001): Traducción y Traductología, Madrid, Cátedra. PACTE (2000). Acquiring translation competence: Hypotheses and methodological problems of a research project. In A. Beeby, D. Ensinger, & M. Presas (Eds. ), Investigating translation (pp. 99-106). Amsterdam: John Benjamins Publishing Company. PACTE (2003). Building a Translation Competence Model. In F. Alves (Ed. ): Triangulating translation: Perspectives in process oriented research (pp. 43-66). Amsterdam: John Benjamins Publishing Company. PACTE (2005). Investigating Translation Competence: Conceptual and Methodological Issues. Meta, 50(2), 609-618. EMT expert group (2009). Competences for Professional Translators, Experts in Multilingual and Multimedia Communication. European Commission. N.p., 17. Göpferich, S. (2009). Towards a model of translation competence and its acquisition: the longitudinal study ‘TransComp’. In S. Göpferich, A. L. Jakobsen, & I. M. Mees (Eds), Behind the mind: Methods, models and results in translation process research (pp. 11-37). (Copenhagen Studies in Language 37) Copenhagen: Samfundslitteratur. Kelly, D. (2005). A handbook for translator trainers, translation practices explained series. Manchester: St. Jerome Publishers. The ability to select only one viable from this series, quickly and with justified confidence. Pym, A. (2003). Redefining translation competence in an electronic age. In defence of a minimalist approach. Meta, 48(4), 481-497. Kastberg, P. (2007). Cultural Issues Facing the Technical Translator. Journal of Specialised Translation, 8. Transfer competence – ability to produce TTs that satisfy the demands of the translation task . Schäffner, C. (2000). Running before walking? Designing a translation programme at undergraduate level. In B. J. Adab & C. Schaffner (Eds. 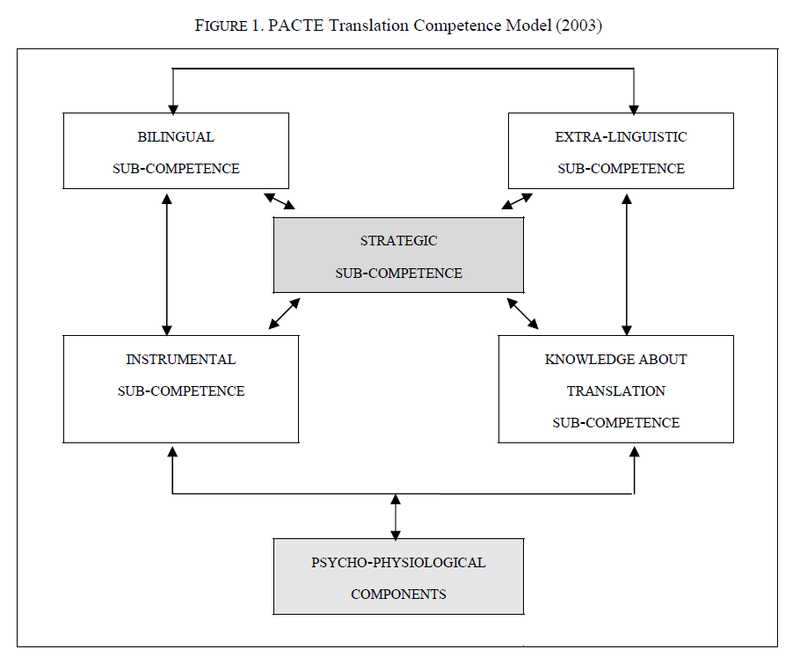 ), Developing translation competence (pp. 143-156). Amsterdam: John Benjamins Publishing Company. socio-cultural competence – awareness of the socio-cultural context in which the ST emerged and an ability to comprehend texts in TL and SL culture. Learning-how to learn – an awareness of different resources and how to use them and how to record ones observations. Fox, O. (2000). The use of translation diaries in a process-oriented translation teaching methodology. In B. J. Adab & C. Schaffner (Eds. 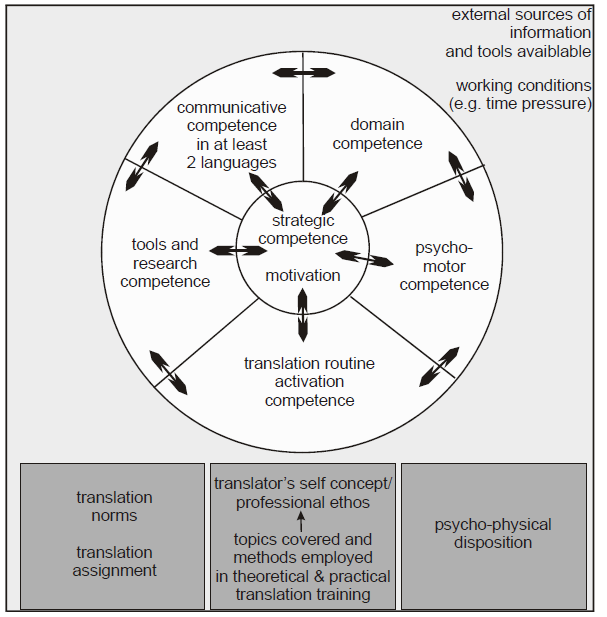 ), Developing translation competence (pp. 115-130). Amsterdam: John Benjamins Publishing Company. Transfer competence – awareness of the translation process (advanced reading skills in SL, deverbalization skills, reformulation skills in TL), awareness of multiple contexts involved in translation, awareness of the interdependence between micro and macro structures in text and translation. Contrastive linguistic competence – knowledge of typographical differences between SL and TL, knowledge of lexical differences between SL and TL and awareness of the limitations of dictionaries, knowledge of syntactic differences between SL and TL. Contrastive discourse competence – knowledge of text type and genre differences between SL and TL, awareness of the relationship between context and register (field, mode and tenor), knowledge of differences in textual coherence and cohesion between SL and TL. Extra-linguistic competence – knowledge of pragmatic and semiotic differences between the SL culture and the TL culture, documentation skills. Beeby, A. (2000). Evaluating the development of translation competence. In B. J. Adab & C. Schaffner (Eds. ), Developing translation competence (pp. 185-198). Amsterdam: John Benjamins Publishing Company. Sim, R. J. (2000). A training strategy for translation studies. In B. J. Adab & C. Schaffner (Eds. 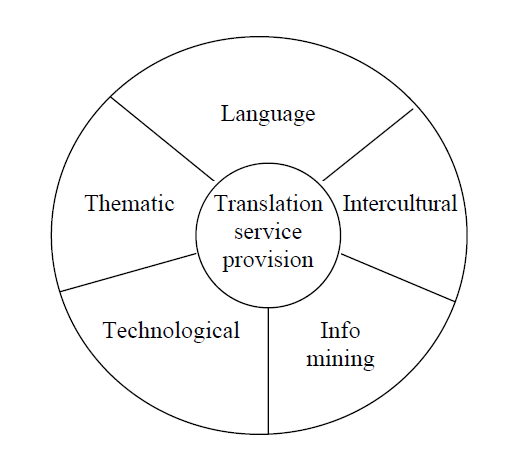 ), Developing translation competence (pp. 171-182). Amsterdam: John Benjamins Publishing Company. Disposition – attitudes and psychological qualities that the translator brings to the task. Proficiency: has to do with certain special bilingual skills, and has a developmental dimension. Proficiency consists of three aspects: lexical coding of meaning, global target language competence and lexical transfer. Campbell, S. J. (1991). Towards a model of translation competence. Meta: Translators’ Journal, 36(2-3). Alves, F., Gonçalves, J. L. V. R., & Rothe-Neves, R. (2003). In search of a definition of translation competence: The structure and development of an ongoing research project. Quaderns. Revista de traducció 6. Biel, L. (2011). Professional realism in the legal translation classroom: Translation competence and translator competence. Meta, 56(1), 162-178. Burukina, O. (2013). The legal translator’s competence. Contemporary Readings In Law & Social Justice, 5(2), 809-826. Cameneva, Z., & Stoianova, I. (2014). Multilingual competence as a necessity in the process of translation. Intertext, 8(29/30), 106. Ehrensberger-Dow, M., & Massey, G. (2013). Indicators of translation competence: Translators’ self-concepts and the translation of titles. Journal Of Writing Research,5(1), 103. Elorza, I. (2008). Promoting intercultural competence in the FL/SL classroom: Translations as sources of data. Language And Intercultural Communication,8(4), 261-277. Erakovic, B. (2010). Successful communication in a beginner’s translation class, or how to help students develop interpersonal sub-competence. Scientific Bulletin Of The Politehnica University Of Timisoara. Transactions On Modern Languages / Buletinul Stiintific Al Universitatii Politehnica Din Timisoara. Seria Limbi Moderne, 9(1/2), 40-51. Eser, O. (2014). Setting learning objectives in translation at the department of foreign language teaching through the concept of competence. Electronic Turkish Studies, 9(5), 943-951. Göpferich, S., Bayer-Hohenwarter, G., Prassl, F., & Stadlober, J. (2011). Exploring translation competence acquisition: Criteria of analysis put to the test. In S. O’Brien (Ed. ), Cognitive explorations of translation (57-85). London: Continuum. Gregorio Cano, A. (2012). La competencia cultural e intercultural en traducción: Estado de la cuestión/Cultural and intercultural competence in translation: State of the art. Ikala: Revista De Lenguaje Y Cultura, 17(2), 129-144. Kaminskienė, L., & Kavaliauskienė, G. (2012). Competences in translation and interpreting. Kalbų Studijos/Studies about Languages, 20138-145. Karoly, A. (2012). Translation competence and translation performance: Lexical, syntactic and textual patterns in student translations of a specialized EU genre. English for Specific Purposes, 31(1), 36-46. Krajcso, Z. (2011). Fostering social competence in translation studies. Babel, 57(3), 269-282. Liao, P. (2011). The relationship between college students’ translation learning styles and translation competence. Compilation & Translation Review, 4(2), 79-104. Malmkjær, K. (2009). What is translation competence?. Revue Française De Linguistique Appliquée, 14(1), 121-134. Martirosyan, A. G., & Petrova, L. G. (2014). Translation as a means of communication. Kemerovo State University Bulletin, (1), 138-141. Pinto, M., Garcia-Marco, J., Granell, X., & Sales, D. (2014). Assessing information competences of translation and interpreting trainees A study of proficiency at Spanish universities using the InfoliTrans Test. Aslib Journal of Information Management, 66(1), 77-95. Ramos, M. (2013). The lexicon in the translation classroom: Designing an acquisition model of the translator lexical competence (English-Spanish). Tonos Digital, (24). Adab, B. J., & Schffner, C. (2000). Developing translation competence. Amsterdam: J. Benjamins. Alves, F. (2003). Triangulating translation: Perspectives in process oriented research. Amsterdam: John Benjamins Publishing Company. Beeby, A., Ensinger, D., & Presas, M. (2000). Investigating translation. Amsterdam: John Benjamins Publishing Company. Brighton, C. (2013). Socio-cultural values in the development of intercultural communication competence. Berlin: Peter Lang. Gutt, D. E. (2004). Challenges of metarepresentation to translation competence.